Attorney General Ken Paxton (left) and Justin Nelson. Texas Attorney General Ken Paxton has a challenger in the Nov. 6, 2018 election: Democrat and Austin lawyer Justin Nelson. 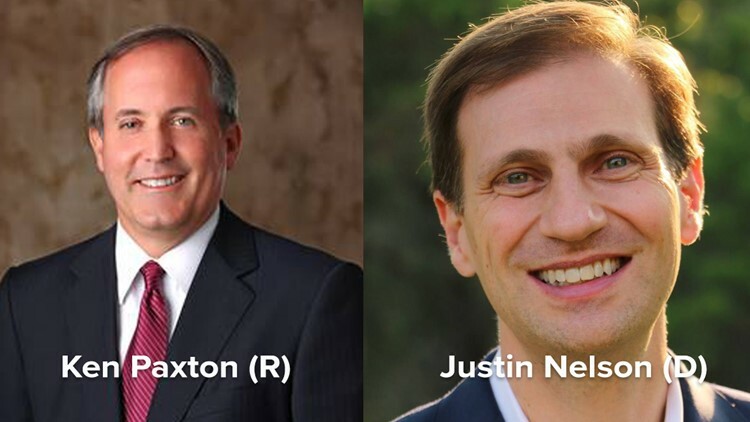 AUSTIN — Texas Attorney General Ken Paxton, currently facing an indictment for securities fraud, has a challenger in the November 2018 election: Democrat Justin Nelson. First elected in 2014, Paxton was indicted by a Collin County grand jury on two counts of felony securities fraud and failing to register as an investment adviser with the state. That means he’s accused of illegally recruiting investors for a tech company without telling investors that he would get a financial kickback. Paxton's opponent, Nelson, told the Texas Tribune he sees the race as one of "integrity versus indictment." Early voting begins Oct. 22 and ends Nov. 2. Election Day is Nov. 6.